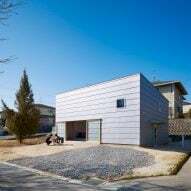 Local studio Suppose Design Office created House in Takaya as a single-family residence on a corner plot in a residential area of a satellite city adjoining Hiroshima. 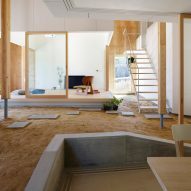 The design of the property is informed by the traditional Japanese concept of a doma, which is an area of compacted dirt typically found between a house's entrance and living spaces. 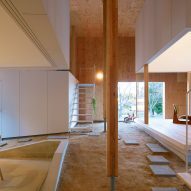 In traditional Japanese homes, the doma accommodated an open fire and was used as a kitchen, as well as for any other tasks that might make the interior of the home dirty. Suppose Design Office reinterpreted this archetype for the 21st century by retaining the site's topography and terrain, and making these part of the completed house. "When thinking of a building, the site is one important element but when building an outer wall it seems like there is a separation between the site and the internal space," the architects said. "So by taking the slope into the building and creating a sloped doma area, it was possible to bring the outside into the building." The house sits on a sloping plot and, rather than levelling the ground, the incline determines the arrangement of the internal spaces. The main entrance leads into the doma area, where cement flagstones form a path leading up the gentle slope into the heart of the building. The doma forms the main circulation space connecting several open or enclosed rooms that are distributed around the perimeter of the house. "The doma is not only a corridor but also somewhere to place shoes or hang paintings," added the studio. "It is a place where it is like an outdoor space but is an internal space, whilst still being a place where the kids play and where neighbours can come and have a chat." The path from the entrance leads past an open kitchen and dining area on one side and a more private hobby room on the other towards a living room further up the slope. The platform containing the double-height living room can be closed off using sliding glass walls, as can the kitchen and dining space. Retracting the sliding walls creates a seamless connection between the living spaces and the front yard, which is accessible through a pair of sliding doors set into the facade. The remaining corner of the ground floor accommodates a storage room with a bathroom perched above it. The master bedroom is situated above the hobby room, and the children's bedroom can be reached using a ladder from the kitchen. 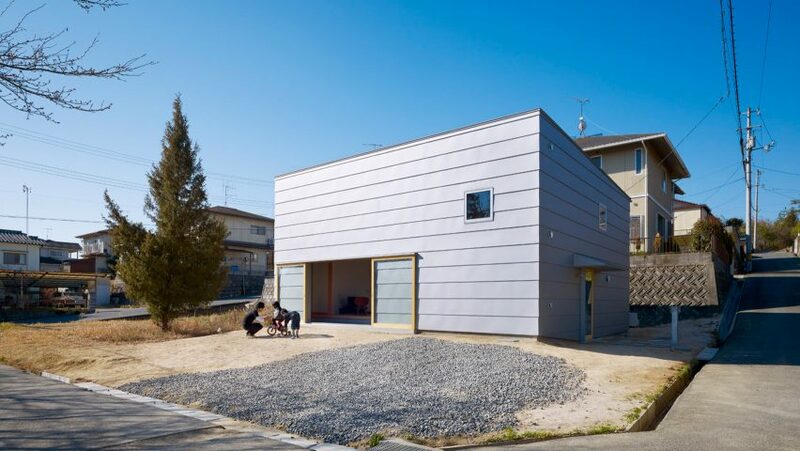 "We hope that in time the house will make the clients' lifestyle better by providing spaces that can change as they progress in life," the architects concluded. "Just like an outdoor space that constantly changes along with the environmental elements." Suppose Design Office also referenced traditional Japanese architecture in its design for Airbnb's offices in Tokyo, which features a sequence of rooms intended to recall the ambience of its surrounding neighbourhood. The studio's other residential projects include a house with a metal roof that completely surrounds the building, and a residence featuring an oversized shingle-clad roof that shelters a hidden garden.